On the surface, Secretary of Commerce Penny Pritzker visiting Tokyo on her first trade mission to Asia seems routine. After all, Japan is one of America’s largest commercial partners, with nearly $400 billion in goods and services traded between the two countries annually, and is also a key participant in the ongoing Trans-Pacific Partnership (TPP) negotiations. But far from a commercial sideshow in advance of President Barack Obama’s visit to the region next month, Pritzker’s first official trip to Japan highlights a quiet transformation in U.S.-Japan economic relations. After years of “Japan bashing,” followed by years more of “Japan passing,” mutual reinforcement between America’s commercial rebalance and Japan’s economic revitalization is bringing Washington and Tokyo closer than ever to sharing a genuine vision for their economic relationship. Beyond bringing representatives from twenty American healthcare and energy firms, this visit also has special historical significance. The last major U.S. trade mission to Japan was in January 1992, under the leadership of then-president George H. W. Bush, who memorably succumbed to a bout of intestinal flu and during dinner vomited on his host, then-prime minister Kiichi Miyazawa. This was in the midst of the trade wars between the United States and Japan over automobiles, and White House claims of “clear and measurable gains” from the trip did little to dampen cries from Detroit for retaliation against Tokyo’s alleged unfair trade practices. That year also marked the onset of Japan’s “lost decades,” during which the country averaged roughly one percent GDP growth per year – and one prime minister every other year. The political and economic environment surrounding this latest trade mission could hardly be more different. In the two months prior to former President Bush’s ill-fated visit, the U.S. economy had lost more than half a million jobs; today the United States is in the midst of the longest streak of continuous job growth on record. Also at the time of Bush’s trip, Japan was just entering its long stagnation; under Prime Minister Shinzo Abe, the economy arguably has its best shot at genuine revival in more than twenty years. And while old disputes over automobiles and agriculture remain significant obstacles to the completion of ongoing TPP negotiations, the dominant tone of U.S.-Japan economic relations has clearly shifted away from the acrid competition of the 1990s. From Tokyo’s perspective, Pritzker’s trade mission helps validate the Abe administration’s economic reform agenda. Not only does it highlight how stronger growth prospects has translated into renewed interest in the Japanese market from U.S. firms, but the choice of healthcare and energy as areas of focus is seen as a positive reflection of Abe’s efforts to advance foreign firm-friendly structural reforms in these key areas. These have included the government’s November 2013 decision to embark on an ambitious liberalization agenda for Japan’s $60 billion electrical power market, as well as amending domestic healthcare laws to boost efficiency, lower costs, and strengthen competition by allowing greater participation by foreign firms. For the United States, the trip is an opportunity to help American businesses expand their presence in the world’s third-largest economy in two key sectors. As the Department of Commerce points out, the $150 billion Japanese drug and medical device market “represents the silver lining of the dark cloud of Japan’s aging population” for U.S. firms. And with the absolute number of Japanese over 65 projected to continue growing for the next 30 years (even as the overall population shrinks), this is an opportunity that will persist over the long term. In the energy sector, the shutdown of Japan’s nuclear facilities following the 2011 Fukushima disaster has forced a major rethink of Japanese energy policy. The result is a new willingness to experiment and a hunger for advanced technologies and creative solutions that can help Japan meet its energy needs – technologies and solutions that American companies are well-placed to supply. 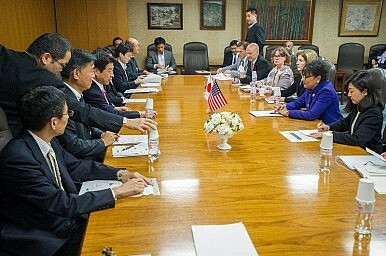 In June 1990, the United States and Japan jointly presented a list of actions for each government to undertake that would lead to “more efficient, competitive, and open markets, promote sustained economic growth, and enhance the quality of life in both Japan and the United States.” Unfortunately, the positive agenda put forward in this Structural Impediments Initiative (SII) failed to stem the downward spiral in economic relations that would doom Bush’s Tokyo trade mission only 18 months later. But fast-forward twenty years and the United States and Japan are closer than ever before to sharing a joint vision for realizing the objectives set out in SII. The Abe administration is actively pursuing an ambitious economic agenda centered on boosting domestic demand, realizing structural reform, and, critically, enhancing international openness. Despite troubles in Washington, through the TPP negotiations the Obama administration has laid the groundwork for realizing an ambitious trade agenda that has the potential to shape the rules of global commerce for a generation. Each is looking to the other for help. David A. Parker is a Research Associate with the William E. Simon Chair in Political Economy at CSIS.